How does it feel to be back at Summer of Sonic? I’m very happy to be here and obviously, with last year being the 20th anniversary, I was incredibly happy to be there too. I wasn’t actually sure I’d be invited again this year, haha! I feel very welcomed by everyone here. Despite being throwbacks to Sonic’s classic era, did you learn anything new while working on Sonic 4 and Generations? With Episode I, there was quite a lot of feedback from the fans saying it didn’t have an entirely ‘authentic’ feel. There was a slightly different feel to it. Our biggest challenge with Episode II was trying to truly get that Mega Drive feel back and to return to the roots of how it was played during that era. The Modern Sonic gameplay in Generations really felt like you’d perfected the formula that began with Unleashed. Do you think we’ll be seeing more games using this formula or will Sonic be moving onto different styles of gameplay? With Unleashed, Colours and Generations, it’s something that is very finished and something that we at Sonic Team are very proud of and we definitely want to continue with this style. However, we’d also like to see a progression and to see new challenges for Sonic’s future. How important would you say it is to broaden Sonic’s range with spin-off titles such as ‘Sonic and the Secret Rings’ and ‘Sonic & SEGA All-Stars Racing’? With Sonic primarily being an action game, it’s very important to keep that as the core focus. At the same time, having things like Mario & Sonic and the All-Stars Racing games is great for giving people who don’t perhaps play action games an easy way to access the franchise. Speaking of ‘Sonic & All-Stars Racing Transformed’, how involved are you with the project? The main development is of course done by Sumo Digital, but I’m very much involved with things like the character and vehicle design so in that sense I’m very heavily involved in the project. Sonic Team has created a few IPs over the years like Sonic and NiGHTS. Would you be interested in creating any new IPs any time soon? Sonic and NiGHTS are very important IPs but on top of that there are other games like Samba de Amigo which we’d love to look into focusing on more in the future. If there are talks and great ideas within the studio then a new IP is definitely something we’d look forward to creating! 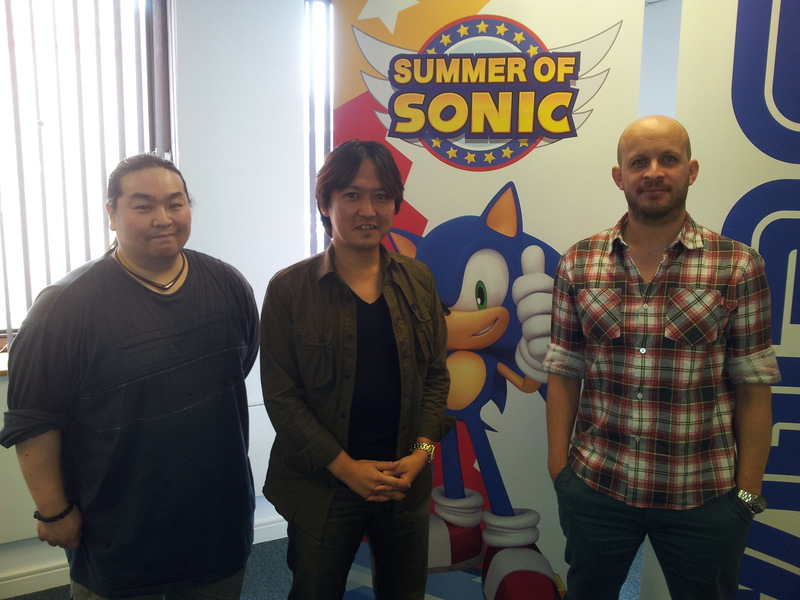 Thanks for taking the time to talk with us Iizuka-San, it’s been an absolute pleasure! Thanks very much to you too, I’ve enjoyed this talk very much! Quite a bit of juicy information there! We’ve still got one more interview coming up soon – Steve Lycett and Tim Spencer from Sumo Digital! Stay tuned!